I can't read novels about dying teenagers anymore. I just can't. I've reached my limit. (I think writing a novel about a dying teenager didn't really help.) 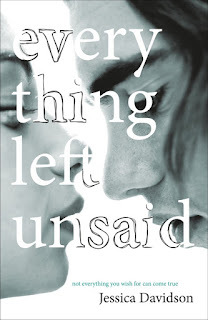 That said, Everything Left Unsaid is beautifully written and sweet and thoughtful. As well as being, naturally, incredibly depressing. This is a good book to read if you want to have a good cry, but then afterwards you should probably read something light and uplifting and not-at-all serious. One of the more remarkable things about this novel is the utter believability of the dialogue. I think there's a tendency in YA generally for everyone's conversations to be filled with incredible wit and snappiness and generally more eloquence than teenagers actually have, which is entertaining but perhaps doesn't always ring true. There was no point at which the dialogue seemed false in Everything Left Unsaid, and the way the characters related to each other (and the way in which they behaved) was very authentic. There's also quite a lot of drinking and sexual references. There's a great deal of realism overall, which makes it all the more heart-breaking. Davidson is yet another Australian writing brilliant contemporary YA. Really. I don't think I've read a single contemporary YA novel by an Australian author in the last year that I've disliked. I'd recommend it to older YA readers (and adult readers also) if only because the tone is incredibly somber. It's a heavy and incredibly poignant novel. If you read it and don't cry (or at the very least get that unpleasant about-to-cry sensation in your chest), then I'm not sure you have a soul.